Enhance my cheekbones you say? Yes please! As one with a bit of a chubby face issue, enhancing (or faking) anything that resembles a cheekbone is a challenge. So when I heard about this ‘cheek bone enhancer’ product I was keen to give it a go. Now I’m not quite so naive to think that it would magically give me the glass cutting cheek bones of a supermodel, but I hoped it might add a bit of a glow/contrast so I could pretend for a while. The Natio Cheekbone Enhancer is smaller than I expected (there’s 3g of product) – I guess I’m used to cheek products in general feeling larger as they are designed for bigger brushes?! 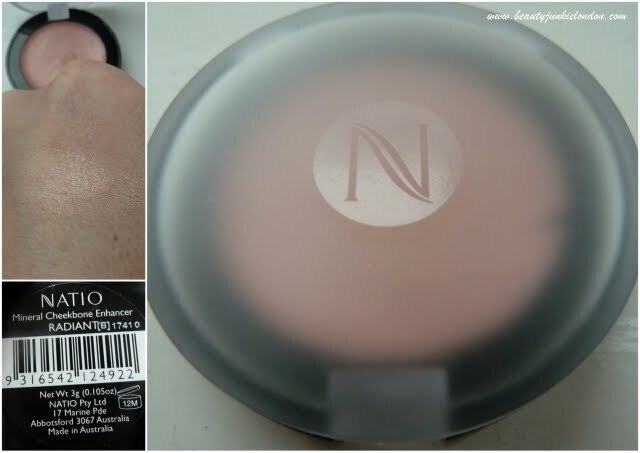 This is easiest to use with fingers as it warms the product up a bit and make it easier to blend into skin. 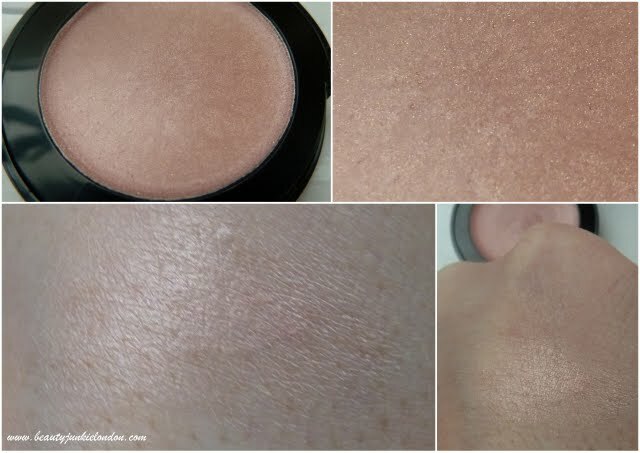 It’s a very subtle product – creamy with a glow/shimmer – but not an obvious sparkly one. It’s ideal for day to day highlighting – looking decent in daylight, where some highlighters can look disco ball in natural light. Natio Mineral Cheekbone Enhancer: Close up (top row) Swatches (bottom row). Because the highlighter isn’t an obvious one, it’s quite difficult to photograph. But on the skin it really does look like a glow, not an obvious highlight – so it works perfectly for my pale skin. I’d love to see how this looks on a darker skin tone – I had a quick look for a blog with this on, but couldn’t find one – so if you know of one do post the link below! The Natio Mineral Cheekbone Enhancer costs a very reasonable £11 and can be found in Debenhams.